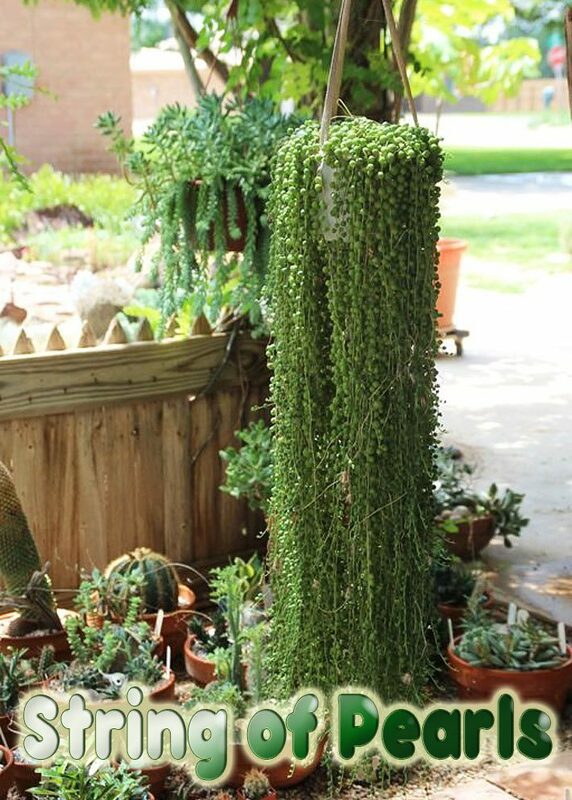 A plant with a distinctive and unusual appearance, string of pearls (Senecio rowleyanus), also known as string of pearls, is bound to be a conversation piece. 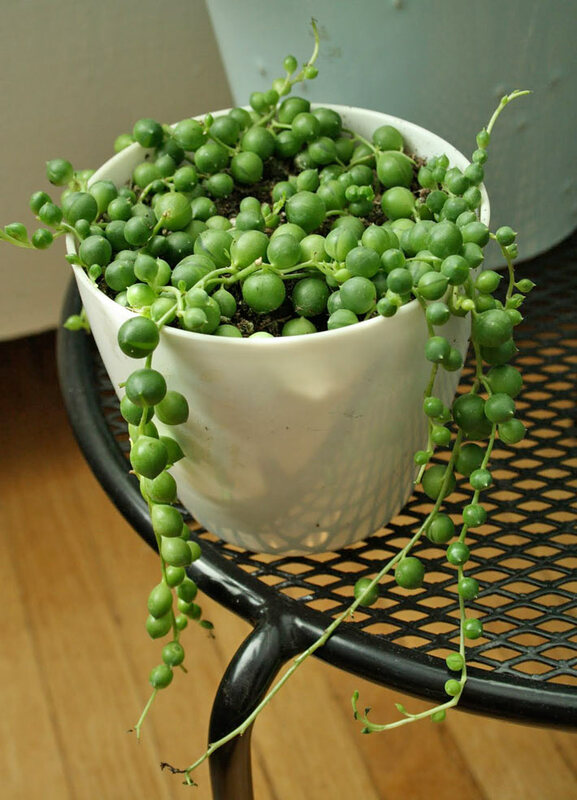 An indoor plant with small, bright green, beadlike leaves that appear on long, slender stems, string of pearls is usually planted in a hanging basket where it has space to cascade freely. The String of Pearls is a succulent plant that has a trailing or cascading habit. 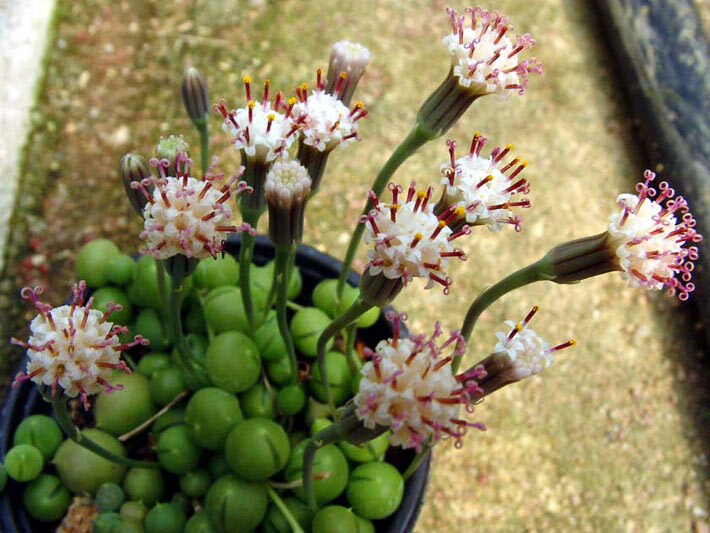 Its pearl-like foliage hangs on the string-like stems, hence the name. It is ideal for hanging baskets or pots. Basically, succulent plants are those plants that store water in their stems or foliage, which makes it easier for them survive during dry spells. While the round leaves of this plant store water, the surface area of the leaves that is exposed to the sun and dry air also gets reduced due to their shape. This helps in minimizing the loss of water through evaporation. If you look at the leaves, you will be able to spot a small point at their tips and a window on the side. These are characteristics that are seen in some succulent plants. These facilitate the entry of light into the leaves, thereby allowing photosynthesis to take place. The window protects the cells from extreme heat. As the stems grow, the adventitious roots of the plant grow into the soil. The plant is a fast grower. As a result, the dense bead-like foliage give rise to a mat-like appearance on the top of the soil. No wonder this plant is ideal for use as ground cover. While its round foliage and trailing habit makes it an excellent houseplant, it is also easy to care for. The String of Pearls plant should be placed at a place that receives bright light. The pot can be placed on a window that faces south or west. The plant will do well if it receives 2-3 hours of direct sunlight and bright, indirect light for the rest of the day. If you are unable to find such a place, you can place them under a fluorescent light fixture. 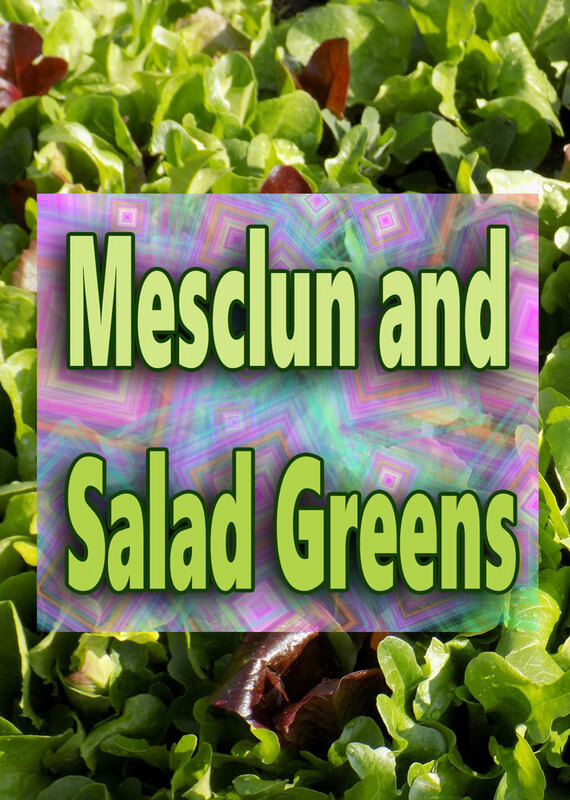 During the growing season, around 14 to 16 hours of artificial light on a daily basis will suffice. Good drainage is extremely important, which is why the use of sandy soil is suggested. You could also use a potting mix that is meant for succulent plants. You could also mix potting soil and sand in the ratio of 3:1. Make sure that the soil is well-drained. Being a succulent plant, String of Pearls can retain moisture in its foliage. 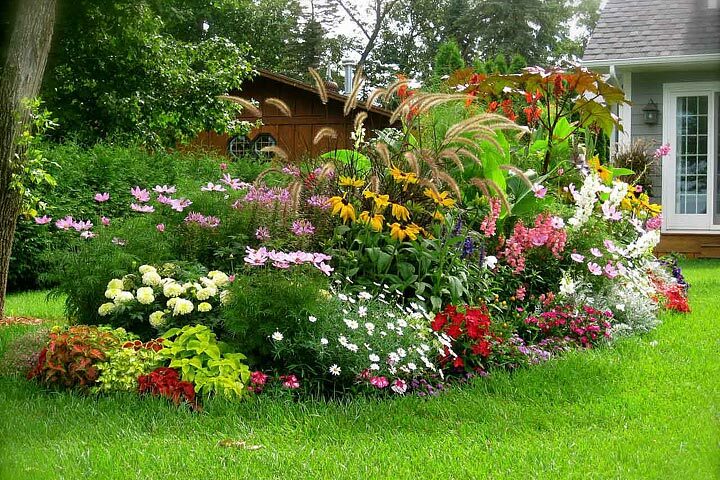 The plant is drought-tolerant, which is why occasional watering will suffice. You can water the plant thoroughly once or twice a month. Reduce the frequency during the winter. Water in such a way that the soil just remains damp or moist. Make sure that the pot has drainage holes. If the pot is placed on a drainage saucer, make sure that there isn’t any water remaining in the saucer. If the plant is watered frequently, the soil will become waterlogged, which will make the plant susceptible to root rot. Allow the soil to become slightly dry before you water the plant. 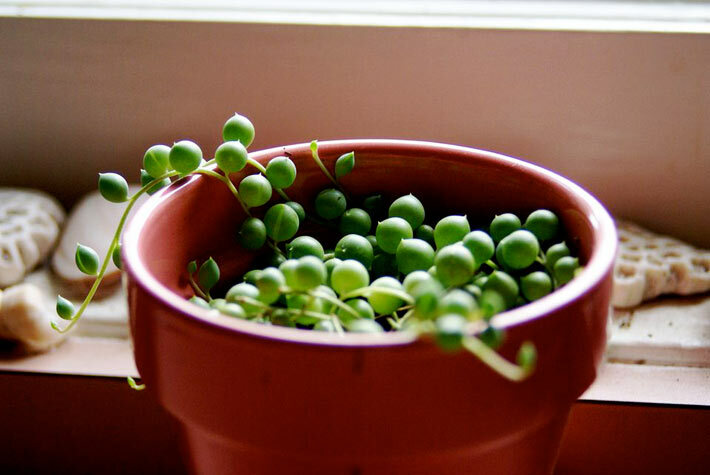 Place String of Pearls plants in average room temperatures. If the plant is placed indoors, make sure that the room temperature ranges between 55°F and 80°F. Ideally, the temperature range should be 70-80°F from spring through fall, and 55-60°F in winter. Though this plant is heat and drought tolerant, it is not cold tolerant. Make sure that the temperature is never less than 45 degrees. So, don’t place it at a place where it is exposed to cold air. Cold air could make the plant susceptible to leaf drop. Apply a general-purpose liquid houseplant fertilizer once or twice a month during spring and summer. Make sure that you dilute it to half of the solution recommended on the label. 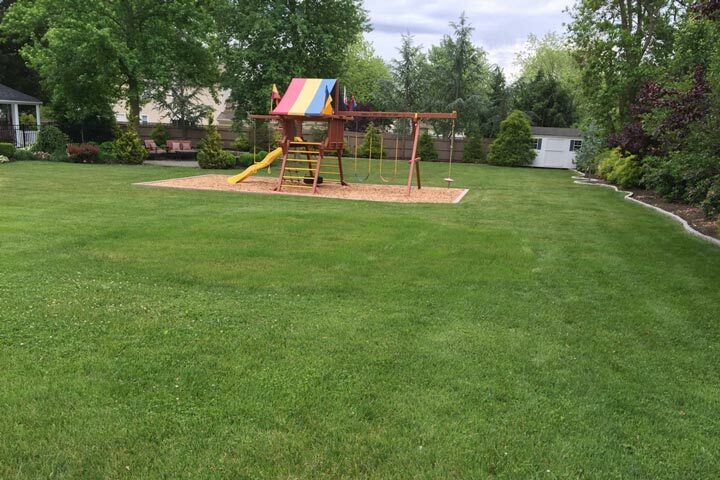 There’s no need to apply the fertilizer during the fall and winter months. Stem tip cuttings can be used for the purpose of propagation. All you need to do is cut a healthy stem tip. The cutting should be at least 4 inches long. Place it in a moist potting mix. Make sure that the leaf nodes are covered with soil. The roots will quickly develop from the axils, which refers to the place where the leaves are attached to the stem. Repot the plant when it becomes root bound. You can use a mixture of commercial potting soil and sharp sand in the ratio of 3:1, or use a potting mix that is meant for cacti or succulent plants. Being drought-tolerant, the String of Pearls is a good choice for xeriscaped gardens. When kept indoors, place the plant in a hanging basket, allowing its foliage to cascade over the edge of the basket. Its bead-like leaves are good to look at. Moreover, very little maintenance is required to keep this succulent healthy. However, gardening enthusiasts who are planning to bring this plant home must be aware of the fact that the String of Pearls is a toxic plant. Every part of this plant is toxic, which is why it should be kept out of the reach of children and pets. In humans, ingestion may cause vomiting or diarrhea, and contact with the plant’s sap could cause a rash or skin irritation. Similarly, ingestion of the plant might cause symptoms such as lethargy, drooling, diarrhea, and vomiting in dogs and cats. It could also cause dermatitis around the mouth due to contact. Where can I purchase a string of pearls plant?? ?